For many weeks I have been reviewing and meeting candidates for the leadership of the federal Conservative party. It has been an astonishing race, with a multiplicity of candidates, few of whom are household names to a significant number of Canadians, and in an electoral process that is a computerized, remote-control treatment of a preferential ballot. Political conventions are admittedly tasteless, laborious, and produce orgies of speechification that will overpower the most indomitable case of insomnia. Future U.S. president Woodrow Wilson, after nomination to his country's highest office in 1912, declared the whole process so demeaning that he said that "There should never be another political convention in this country." But at least they have their dramatic conclusions in a run-off ballot, and there are amusing moments and occasionally eloquent addresses. The convention is a spectacle that generally incites some public interest. The conventions that elevated Pierre Trudeau as Liberal leader in 1968 and in the Joe Clark-Brian Mulroney era of the Conservatives, 1976-1983, yielded great speeches (by Trudeau, and by Claude Wagner in 1976), and dramatic outcomes. The Conservatives, in what must be the final and perverse emanation of the desiccating Harper influence, will have ballots posted by paid-up party members in which they may state the full list of the order of their preferences among the candidates. The computerized counting system, once all the preferences have been inserted, will conduct an electronic sequence of ballots, in which the cumulative last candidate is dropped each notional ballot, just a few seconds apart. So a vote for 10th place on the first ballot may have, less than a minute later, greater relevance than a first-place vote on the first ballot. This is a roulette game of high-tech homogenization, and the result could be hilariously unpredictable. The organizers are assuming that most party members-voters will only put down one or a very few names. But, as I understand it (from several of the candidates), someone who is on the top-10 choices of virtually 80,000-plus possible voters, would likely defeat a candidate who was not on 20,000 individual lists of preference, but ran ahead of the above candidate on all of the 60,000 ballots where that candidate was mentioned. It is mystifying that the Conservatives should have settled on such an unspectacular and bloodless method of selecting a leader, to wind up a process that has attracted very limited public interest despite months of internecine campaigning. The candidate who was predestined to win was Jason Kenney, but he returned to Alberta instead, to rescue that province from the NDP, a high and surely successful calling, but it has left the federal Conservatives without an obvious candidate. Most of the prominent members of the Harper government departed more or less with the leader, as John Baird and Peter MacKay retired from politics and finance minister Jim Flaherty died. Yet the Conservatives are better placed as an opposition party than at any time since R.B. Bennett at the onset of the Great Depression in 1930, (when his path to office was eased by liberal scandals and Liberal leader Mackenzie King's denunciation of the Depression unemployed as "slackers"). Brian Mulroney was also strong in 1984, but no one except him knew how he was going to crack the Liberal hold on Quebec. In the 2015 election, the Conservatives elected 99 MP's in a 338-member House of Commons, trailed the Liberals by 7.5 per cent country wide and on average in Ontario, Manitoba, and British Columbia. And although they only took about 20 per cent of the vote in the Atlantic provinces, they ran ahead of the NDP in all but Newfoundland; and defeated the Liberals by 25 points in Alberta and Saskatchewan. In Quebec, the Conservatives actually gained five MPs over the previous election, and won a respectable 17 per cent of the vote in a four-party race, though they received only about half the votes in the province of the Liberals. Quebec highlights the present opportunity and the danger for the Conservatives. From 1896 to 1984, the Liberals won heavy majorities in Quebec, sometimes all or almost all of the entire parliamentary deputation from that province, which has declined in the last 120 years from about 30 per cent to about 23 per cent of the total number of MP's. (The one exception was 1958, when five-term Quebec premier Maurice Duplessis, in an act of vengeance for the federal liberal intervention against him in the 1939 Quebec election, had his muscular Union Nationale machine deliver 50 of the province's 75 constituencies to John Diefenbaker's Progressive Conservatives.) In 2015, the Liberals took 40 of the province's 78 MP's, to 16 New Democrats, 12 Conservatives and 10 Bloc Québécois. The NDP lost more than 40 MP's in Quebec, as they were caught straddling between the separatists and the outright federalists (Liberal and Conservative), and because their leader, Thomas Mulcair, took a commendably principled but tactically misguided stand in favour of a woman's right to wear Islamic face-concealing clothing at official ceremonies. In general, Quebec is becoming more receptive to a conservative economic message, and the Conservatives, largely thanks to Brian Mulroney, have lived down their former reputation as a conscriptionist, anti-French, and anti-Roman Catholic party. In Quebec, even the non-French fifth (or so) of the population want a federal government that is well-disposed to the French-speaking parts of the country, and about a little over a million Canadian non-Quebeckers are primarily French, though almost all of them are bilingual. Over three million Quebeckers are unilingually French-speaking. Though some Conservatives, including some leadership candidates, affect to believe that the French-speaking population is adequately taken care of culturally by having government services and media available to them in French in every place where they are at least 10 per cent of the population, that is not the French-Canadian view of the nature of the country. Nor is it the perspective of English-speaking Canadians who adhere to the founding formula of two co-equal official cultures, which was institutionalized by the government of Pierre Trudeau, after a rending but almost bloodless and successful battle with the Quebec separatists. Both authentic French-Canadians and other Canadians who strongly support conciliatory arrangements between the official language communities will object to the elevation of any leader of the federal opposition who is not reasonably bilingual. Brian Mulroney and Stephen Harper are bilingual, and so have been all Liberal leaders since Pearson, who retired 49 years ago. Those interested in the continued revival of a functioning two-party system in Canada should not be complacent about the implications of returning to an official opposition where the language of the francophone fifth of the country cannot be managed by the Conservative leader, and the unilingual French 10 per cent of the country have to listen to their country's leader through an interpreter. No unilingual party leader, with the arguable exception of Joe Clark (who remains the only person in history who ever defeated a Trudeau, however briefly), has won a federal election since the Pearson-Diefenbaker era, two full generations ago. An attempt to return to it by the Conservatives this year would disappoint at least 40 per cent of the country, and be rather provoking to almost a quarter of Canadians, and extremely and needlessly hazardous to that party. There would be a high likelihood that Canada would revert to 1.5 party rule, as between 1896 and 1984, when the Liberals won 16 general elections, 15 with parliamentary majorities or near-majorities, to six Conservative, three with fragile majorities, and one Conservative-led coalition victory (1917) and one effective draw (1925): 63 years of Liberal government to 18 Conservative and four by coalition. 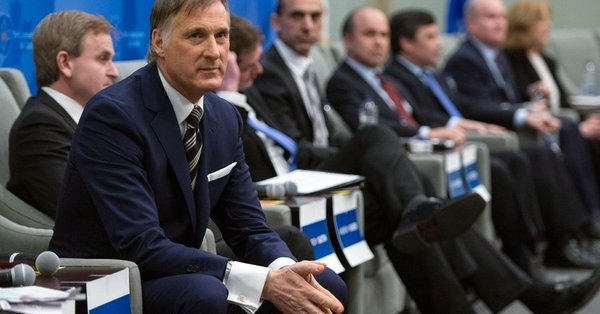 By this criterion, of facility in both languages, the only Conservative leadership candidates running now who could win a general election are Maxime Bernier, Chris Alexander, Andrew Scheer, Steven Blaney, and Pierre Lemieux. Of these, only the first four have held a serious political position. I know all but Blaney, and all would be plausible. That Bernier was dropped from the cabinet for a minor indiscretion and that Alexander lost in the last election (over the fraudulent allegation that he had, as minister of immigration, declined admission to a Syrian child who subsequently drowned in the Mediterranean), is neither here nor there. (King lost his constituency four times, and John A. Macdonald once, and they were party leaders a total of 64 years and between them won a total of 13 general elections, and led or co-led the government for 50 years, including the pre-Confederation United Province of Canada-Ontario and Quebec). Most of the other candidates, and certainly those that I know, have considerable merit, but I doubt if a unilingual Conservative leader can win. The Liberals would enter Ontario going west with a 70-seat lead and would almost certainly pick up enough, (less than a third of the 228 constituencies in Ontario, Manitoba, British Columbia, and the territories), to meet the House, and have always been able to outbid the Conservatives for the support of the NDP (1972-1974), or its predecessor, the CCF (1925-1926). Eligibility to vote in the Conservative leadership doesn't close for another six weeks and I will revisit the race after that. There are worse fates than going back to long-term Liberal government, but the Conservatives want to win and shouldn't do things almost certain to assure that they won't. It is good for governing parties to know that they could lose. Both sides should get to bat.